est of both worlds! Relaxing countryside studio attached to owners 1860's Station House, uniquely placed just 10 mins drive from the vibrant city centre with all it has to offer. Excellent public transport The Cwtch is situated in the quiet village of Taffs Well on the outskirts of Cardiff. The property is nestled at the foot of the Garth Mountain with beautiful views of the surrounding countryside. The studio has easy access to transport links and many local amenities including shops, restaurants and real ale pubs. A short walk to train station. It is the perfect base for walking and cycling holidays with the Garth mountain, Taff Trail and Castell Coch within easy reach. Many places of historic interest including Castell Coch, Caerphilly Castle, Cardiff Castel and St Fagan's National History Museum. excellent local wine available at Llanerch Vineyards. Showcase cinema, restaurants and leisure facilities 5 minutes drive away. Nearby farm shops offering local produce. A lovely wee place to stay. Spotless clean and well equipped. Good wee pub serving food next door. So much in a cosy little room. Fantastic get away. Owners are really friendly and full of helpful advice and suggestions. Felt very welcome and left to our own devices. The property backs onto a railway, but that was barely noticeable. Very easy access to Cardiff via train. 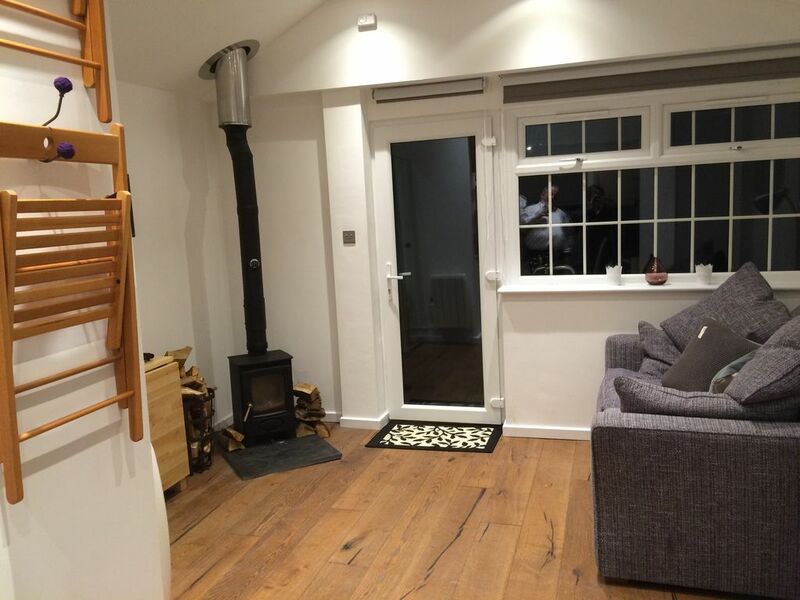 The log burner was a nice touch and made the whole experience that much more cozy. Robert was very friendly and helpful. Made us and our little dog feel very welcome and at ease. We would definitely recommend this cottage to anyone visiting Cardiff. Quaint, cosy and very comfortable. We just loved our stay in the adorable ‘The Cwtch’ studio apartment. We were made to feel so welcome by Robert who greeted us very warmly and had lots of good suggestions for things to do. We had a bit of rain during our stay - which meant we got to spend plenty of time relaxing by the wood fire. Don’t less the size fool you - the apartment is very well designed and is very comfortable with everything we could have wanted for our stay. It was very clean and only a short walk from the train station to get into Cardiff (or buses right out front in either direction) however Taffs Well is so pretty you might want to stay put! We loved it and hope to be back some time. Thank you for having us. Jodie & Eddie.